What is Team Development from a “TeamsRock” perspective? First, you have to understand that you can’t have a team without a group of “I”‘s. 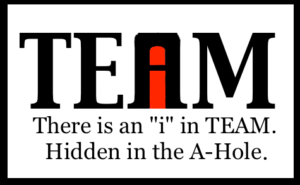 The old expression is, “There is no I in Team.” Have you ever seen the I in team? When we’re talking about team development; getting a team to develop, to come together, there’s so much to consider. Number one, we’ve got to make sure the chemistry is right. I go back to the movie Miracle. Herb Brooks says, “I’m not looking for the best players, I’m looking for the right players.” In the opening scene, he’s being interviewed for the job, and he’s talking about changing the way they play the game, changing this and that, and his last line in that segment is, “And most of all, team chemistry.” He’s focused on team chemistry from the very beginning. That’s all he focused in on, getting them to understand that together they’re stronger, together they’re better. In the movie, they went to Norway to skate against the Norwegian National Team for an exhibition game. And they tied. Now, in sports when you were in school, did the coach every make you do something called suicide runs? Herb had them doing it on the hockey rink the same way. He has them do suicides and after the hockey game is over and he is angry with these boys because they have all been playing as individuals. He’s been asking them who do they play for. “What’s your name? Who do you play for?” You know, “Mike Rucioni I play for Boston University.” “Jim Craig, I play for Boston University,” etc. He’s got people from all over the country playing for different teams. And he’s just so frustrated because he’s not getting them to think like a team. Finally yells at them and says, “The name on the front of your jersey is a hell of a lot more important than the one on the back of your jersey. Get that through your head!” What’s on the front is USA, on the back is their name. Team development is about getting people to think in one direction. Johnny Damon used to play baseball for the Boston Red Sox. When he played for the Red Sox, he had long hair and a wooly mammoth beard. Then he took a job with the New York Yankees. He cut his hair and shaved his beard, because the New York Yankees had a policy that says military grade haircuts and no facial hair. Now, they have since relaxed that policy, allowing a very trimmed mustache, but that’s it. Oh, and you know what else? The New York Yankees do not put the names of the players on the backs of their jerseys. They are about a team, not about an individual. There’s a reason the New York Yankees have won more World Series than any other team in the history of baseball. Team development is about getting people to think like a team. How do they think like a team? Everybody on the team has to be able to be responsive. They have to take ownership of every situation, regardless of what is going on. They have to have the right chemistry, and they’ve got to continuously build knowledge. Within that, they have to identify the dimensions. What are the dimensions? The dimensions of the team are the creators, the advancers, the refiners, and the executers. Creators are those people that, when you have a project meeting, or a brain storming session, come up with new ideas all of the time. Advancers don’t necessarily come up with new ideas, but they can hear an idea, and they say, “I did that once before. It worked really well. We can do a twist on it this way now.” They are the cheerleaders and the salespeople for the project. The refiners are the people that others love to hate, yet they are so critical on a team. The refiners are the ones that will see the things that the creators and the advancers just don’t see. Yet the creators and advancers think they are naysayers, that they are negative. They think they are trying to put it down, they don’t want it, they think they’ve got it in for them. Nothing is further from the truth. They want to see it succeed, but they say it won’t because of “this” or “that.” They’ll see things that the creators and advancers just can’t see. The executers are the ones that are great at executing, at getting the job done. Team development is about getting people to understand effective hand-offs between tasks and assignments and how a process works.